A taco salad recipe that is simple, healthy and quick to prepare from The Dinner Plan Man. To prepare the chicken, rub the breast with the Taco Seasoning and grill it on a greased grill until it is cooked through. Meanwhile whisk together the sour cream, milk, and Chipotle Ranch; set aside. Divide the salad among 4 plates, top with avocado, black beans, corn and cheese. 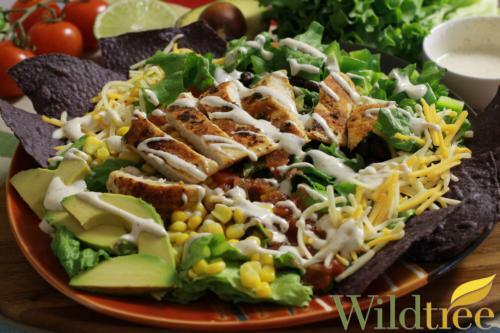 Slice each grilled chicken breast and lay it on top of the salad. Drizzle with the Chipotle Ranch Dressing. In a large skillet, heat Grapeseed Oil over medium-high heat. Add turkey and Taco Seasoning and saute for about 10 minutes, or until turkey is cooked through set aside. In an extra-large salad bowl, gently toss lettuce with avocado. Add tomatoes, cheese, and tortilla chips and toss again. Evenly distribute the seasoned meat over the salad and garnish with salsa.